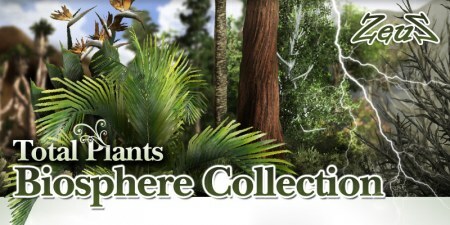 Description: Total Plants Biosphere Collection contains 400 Live Plant variations (including a few creatures). This pack gives you a tree and plant system in which parameters are provided that allow for various effects to be applied. You may plant trees on the terrain or even link or attach them to some other target objects. The trees cast and receive shadow, even swaying with the wind when you play back your project. The Ultimate & best Amazing trees collection . Really thanks for all your so artistic art devotion posts Buhta ! Let's grow the plants ! TX ZeuS ! would be awesome for total plants 2! Thank you very much dear zeus. Уважаемый,ЗЕВС!!!!! Огромное Вам спасибо,СПАСИБО и СПАСИБО!!!!!!!! This is beautiful!!!! Thank you very much!! !